Guildonian Players: Seven doors, three phones and over 50 sound cues- it must be first rate farce! Seven doors, three phones and over 50 sound cues- it must be first rate farce! Our next show show opens tomorrow night! It's pure entertainment - the fabulous funny farce Caught in the Net by master of the art Ray Cooney - book your seats now! The ever-spiraling situation gets increasingly out-of-hand as John & Stanley desperately struggle to juggle with the truth. With seven doors, three phones and over 50 sound cues, its busy busy busy - but what else would you expect from a first rate farce? 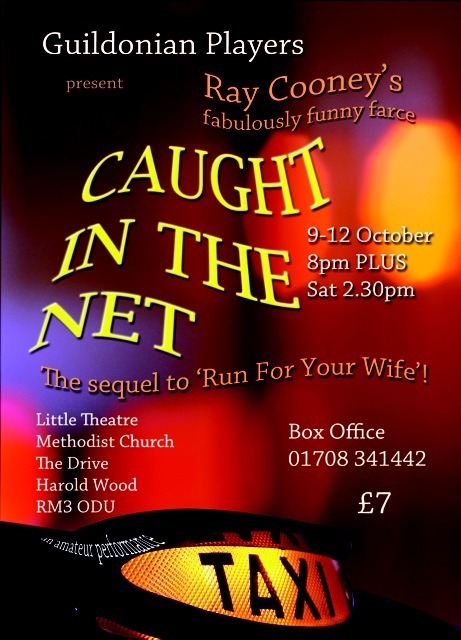 So if you if you fancy an evening of amusement and laughter, come and see Caught in the Net!